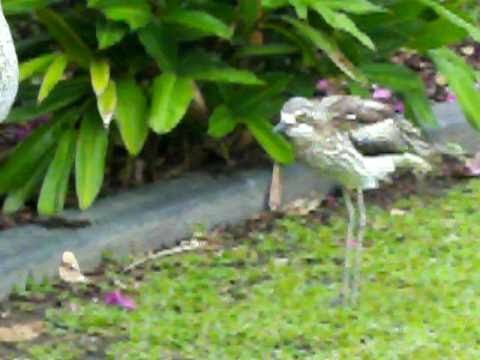 Bush Stone-curlew's are large, slim, mainly nocturnal, ground-dwelling birds, and are endemic to Australia. Although they look rather like a wading bird and are related to the oystercatchers, avocets and plovers, they are a terrestrial predator filling an ecological niche similar to that of the roadrunners of North America. They specialise in hunting small grassland animals: frogs, spiders, insects, molluscs, crustaceans, snakes, lizards and small mammals are all taken. I reckon they're awesome birds, and I adore those beautiful big eyes. In recent months the curlews have moved into my local neighbourhood. I've not seen them during the day, but I have at night, and the mournful cry leaves no doubt what species it is. Check out the video. This spotting was roadside in a small bayside village, but very close to an extensive bushland area. They seem to like open areas like golf courses and parkland as well. This species is classifies as endangered in NSW and Victoria. They range throughout most of Australia and were formerly quite common, but have declined in numbers through habitat loss and predation by foxes and feral cats. So sad that foxes take such a heavy toll. Didn't know about beach stone curlews either. Amazing looking birds. Great photos Neil. These & the beach stone curlews are such odd characters with that slow movement and staring pose. Heard them all through the night when I was bogged on Fraser Is, but didn't see them, very secretive birds. Heard them sometimes at night near home about 15 years ago but they disappeared as foxes moved in. Very sad. Thanks, Mark. The fourth photo is actually the first I shot. This fellow was totally motionless in full hunting mode, putting those big eyes to good use. Such intense eyes on these guys. Great shots Neil. Same for me. I went for the first time during our trip last year and I can't believe I had never been before. I also liked that it was so laid back and low key. Thanks, Daniele. It was my first trip, but the first of many. I had no idea what an amazing and beautiful place it is, and wildlife everywhere. I stepped off the ferry and saw a koala. You don't get that too often in the city. I cannot wait to get back over there. Nice series Neil! I love Stradbroke Island.